I don’t really like sitting down and watching movies. Quite frankly, I don’t like sitting. So, when the hubs wants to watch a movie, I get everything ready with as much stuff as I can get in my arms, so I don’t disturb the man watching the movie. I tune in more to the fashion and interior spaces than the actual plot lines. If there is a show I’m actually into, I’ll find myself rewinding to listen because the first time I was engulfed in the buffet table with amazing display pieces in the back ground. Trust me, I’m getting to my point. The movie The Break Up is a wonderful chick flick movie, but what I like most about this movie is the decor! Everything from the art board, kitchen, and master bedroom is awesome. Plus, being set in Chicago, it’s all around awesome. 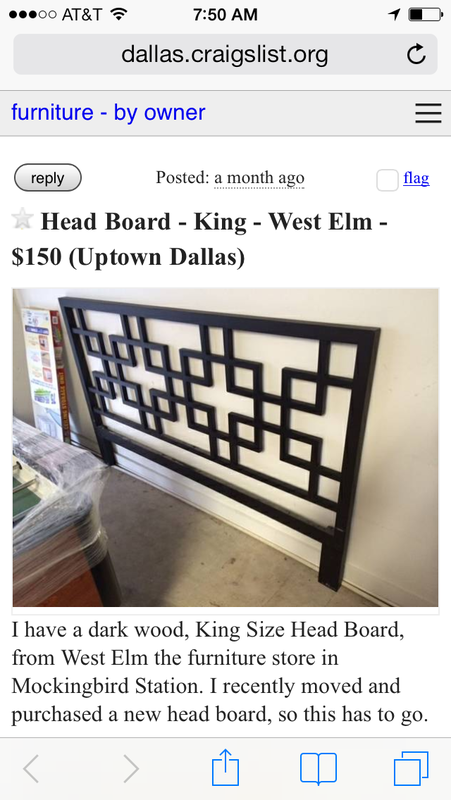 I was searching the internet for a headboard one night for our master bedroom and came across this craigslist find! After I searched all my favorite sites, I always end up on an estate sale site or craigslist! I highly recommend them both for bargain hunting and unique finds. This was the headboard from The Break Up which retails for around $600, and they were selling it for $150! What!?! How exciting! I was super pumped and e-mailed the listing right away! 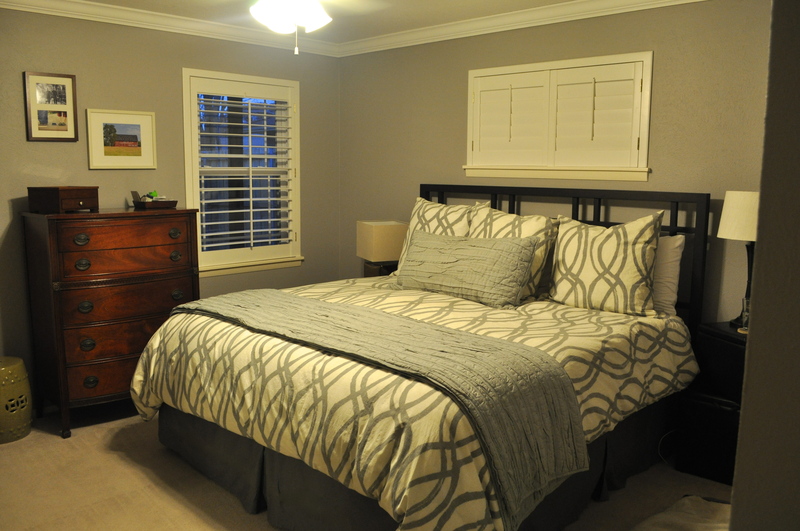 Luckily, it was still available, I think only because he spelled headboard as two words instead of one (advantage: me)! We got it the next weekend and set it up! 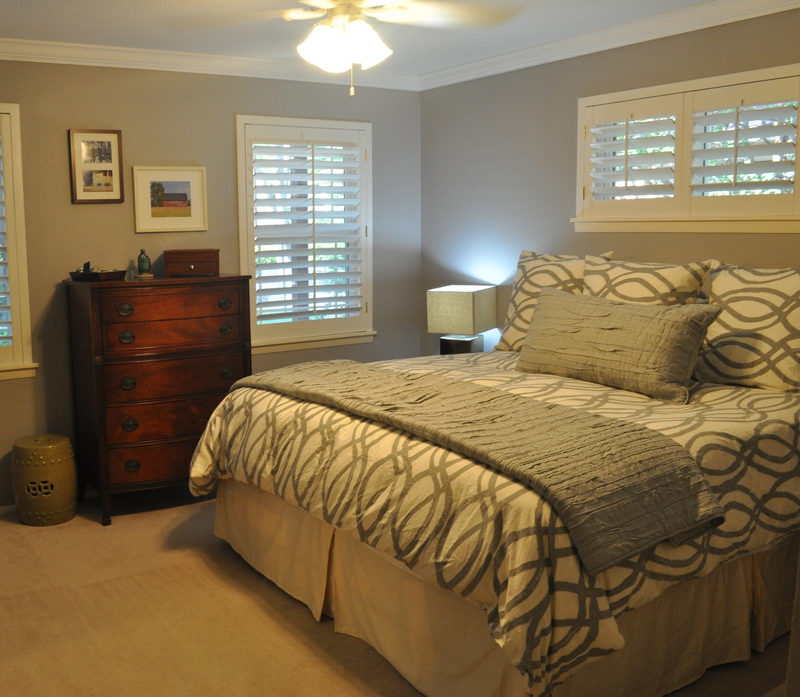 To this: Sorry, I should have put down the pillows a little more so you could see more of the headboard, but the duvet and pillows were so perfect, I couldn’t move them! Now, I have a little piece of The Break Up in my Dallas home! Ha. Happy finding inspiration for your furniture, friends!